This is my place in cyberspace where I can be me. My writing will reflect things that are important to me--God, country, and family---children, grandchildren, family, friends, Bible study, devotions, my love of life and my passion for things in our culture that are affecting our Christian heritage. From time to time, I will share my space with fellow writers who have a message I believe in. Kathy Ide’s book, Polishing the PUGS is the first book I reach for when I am writing or editing and need help. When I teach at writers’ conferences, I recommend it to the people in my class and usually have one on hand to show to them. I also tell my editing clients about it and suggest they purchase one. Now Kathy says, "Don't buy Polishing the PUGS." What? Why? And the answer is---Kathy brings us a new book, Proofreading SECRETS of Best-Selling Authors. In the introductory pages Kathy explains the importance of good editing. She says "Words and Punctuation are the tools of a writer's trade and calls this book 'the owner's manual for the tools we use in our writing.'" This book contains most of the material from the PUGS book, updated to correspond to the latest editions of the industry standard professional books for writers and editors: The Chicago Manual of Style, The Associated Press Stylebook, The Christian Writer’s Manual of Style, and Merriam-Webster’s Collegiate Dictionary. Kathy doesn’t just tell you the rules; she gives you examples and cites her sources. The first twenty-six pages of this book contain additional helpful comments from Kathy and the SECRETS she promises in the title. She quotes such well known authors as Gayle Roper, Kathi Macias, Cindy Woodsmall, Renae Brumbaugh, Mary DeMuth, and Wanda E. Brunstetter. The book is endorsed by Cecil Murphey, author and coauthor of more than 135 books, Pam Pugh of Moody Publishers, Nanette Thorsen-Snipes, freelance editor, and several other authors and editors. 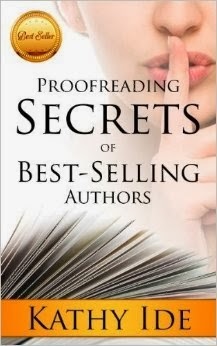 Proofreading SECRETS of Best-Selling Authors has just been released. Order your copy today and come back here to leave your comments about the book.